An iconic normality. As a vision, The Undertones were glorious in their mundanity. Out from a Derry beset with ‘the troubles’, they emerged into flamboyant Belfast looking every inch the effortless outsiders. Rather like The Fall’s parallel story in Manchester at the time, they played no head to sharpness of apparel. Not ragamuffin either, nor sleazily rockist. Just lads out from the sticks. And yet one glance at the cover of this exhaustive anthology is enough to confirm The Undertones as instant and eternal conveyors of the look and feel of their time. Seemingly without even trying, they usurped their illustrious contemporaries in the talent-stacked post-punk era. Yes, they made it all seem so easy, which was the very essence of The Undertones. They learned their craft in the kitchens, scout huts and youth clubs of their native city before entering a ‘Battle of the Bands’ contest in Belfast on June 14, 1978. To the Belfast crowd they may have looked ungainly, clueless even. But – and this was the trick – by this point they were already a clankingly effective live band. The very next day they entered Wizard Studios and, with disarming nonchalance, whipped out ‘Teenage Kicks’, unquestionably one of the greatest singles of the era…or ANY era. Had The Undertones disbanded the very next day, they would still have attained a lasting cult status. For this was the archetype of post-punk magnificence. One of those records that should be force- fed to every young band who has struggled to fill their demo with freshness and vitality. Almost on a par with their heroes, The Ramones – with whom they are seen cavorting in the accompanying booklet – they laid down a beautiful template. ‘Teenage Kicks’ became the launch pad of a career that saw the band bravely attempting to cross to the pop platform that began to dominate at the start of the eighties. The problem was simple. Signed to Sire, and with big money backing, they were expected to smooth-out and produce a run of effortless hits. 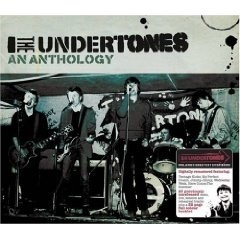 But the Undertones were The Undertones. They might have emerged from a near war zone, but they sang songs of girls, loneliness, jealousy, football and all manner of juvenile hedonism. It is what they were. Honest. Organic and hugely talented. The proof is here. The 29 tracks that cluster on disc one pretty much map out this tentative career, with primary riffs and an innocence that seems all the more poignant, in these darker days. Perhaps not darker in Derry, but there is a simplicity of a life spend wearing cherry red Doc Martins, duffle coats and Levi’s here. If The Undertones were a film… Shane Meadows would be directing. Revisiting these songs in 2008 is a joy. The discovery perhaps, of intelligent life after the holy trinity of ‘Teenage Kicks’, ‘Jimmy Jimmy’ and ‘Get Over You’. While those songs evoke days scampering around crumbling garages, cider swigging and scoring swift feels in a pre-dope teenage rampage, a more domestically minded lyricism arrives with the likes of ‘My Perfect Cousin’ and ‘Family Entertainment’ which both served to parallel the north London affairs of Madness. In Feargal Sharkey – the gawky kid who had always sung in the choir – they had the vocal weaponry to take on all-comers. Indeed, it’s a powerful force that only stutters when the song writing begins to pull away from its unshakable simplicity. It is best, I think, to ignore the eighties cliché’s that started to gather towards the end, when Sharkey fled back to the charts via a solo career before taking up his position in A&R, leaving the band to splinter into the more eclectic That Petrol Emotion. Back to back, the songs crash by to near Ramone effect, and charmingly so. For an ex fan such me, and one who hasn’t passed this way for over 20 years, other than brief blasts of TK on John Peel tribute shows, this really is a time machine of a record. Disc two provides the obligatory ‘collectors items’. Live renditions, once sunken demos, out-takes and obscure ventures. Naturally this is a rather more difficult listen, and does tend to showcase the fact that even The Undertones could struggle with that confounded muse. It didn’t always work to such simplistic effect. The accompanying booklet contains a wry biography written mainly by Michael Bradley from the band. It succinctly captures the tale of lads on the bluff and seems curiously free of ego. It also feels as if they have reached that pleasant land, where the ego clashes of old have been largely forgotten… and friendship returns. Without friendship, this band would never have existed.